75 kvm. i tre store værelser, + tilbehør udsigt over den store have. Lejligheden består af tre store værelser: stue med sovesofa, soveværelse med dobbeltseng med påklædningsværelse, stort køkken og også indgang, badeværelse og entre. Alt i lejligheden direkte udsigt over den store have, fuldt møbleret og med privat eksklusiv brug. Beliggende i stueetagen og vender mod indersiden af ​​den store have huset er stille, køligt og støjsvagt. Godt møbleret, rummelige og komfortable, giver en behagelig og behagelig ferie i Firenze. badeværelse, med udsigt over det store have, fuldt nyligt renoveret. Gorgeous apartment with everything you need. Host's Anna and Giorgio are truly sweet people. You can not ask for more if you want see Florence. We would go back to this apartment in a heartbeat. My husband & I stayed here on our recent trip to Florence (3/25-4/4). We absolutely love this apartment, had a fantastic experience working with Anna and Giorgio, and would love to stay here again. Apartment details: This is a very roomy, comfortable apartment for two people, and though the building is located on a busy street, the apartment and back garden is quiet and peaceful. Overall: the apartment is immaculately clean, the bathroom is new and spacious, the bed is very comfortable, the kitchen is well stocked with tools if you'd like to cook, the appliances work like a charm (and the owners provide clear instructions), and that back garden is a wonderful respite from the hustle and bustle of the city. In short, I would live here if I could. Bonus: washing machine runs well and also has a drying cycle, but I recommend line drying since you have access to the outdoors. Location: Ideal if you like to walk and be close to the city without being in the middle of crowds of tourists. Florence is a very walkable city, and the apartment is located near bus stops, too. Also, you are within blocks of incredible restaurants, a gelato shop, and supermarket, so it's very convenient. The Owners: Anna and Giorgio are wonderful people. They are responsive, helpful, terrific hosts. They welcome you and offer you all the information you need (a handy map, where to catch the bus to Sienna, how to use the washing machine, etc). When we had a mishap with our connecting flight and ended up arriving well before check-in time, I emailed Anna and she replied immediately and welcomed us to come to the apartment early. When I inquired about calling a taxi service for a 6am pick-up, Anna took care of calling the taxi for us (and woke up at 6am on a Saturday when the taxi driver called!). When you're far from home and have a lot on your itinerary, it is a gift to have landlords that make your stay so comfortable and stress-free. Thank you, Anna & Giorgio! A wonderful place to stay. Our hosts were lovely and the apartment was well located, comfortable and clean. thanks for kind words for us and for the house. You were nice host and we hope to meet again in Florence. 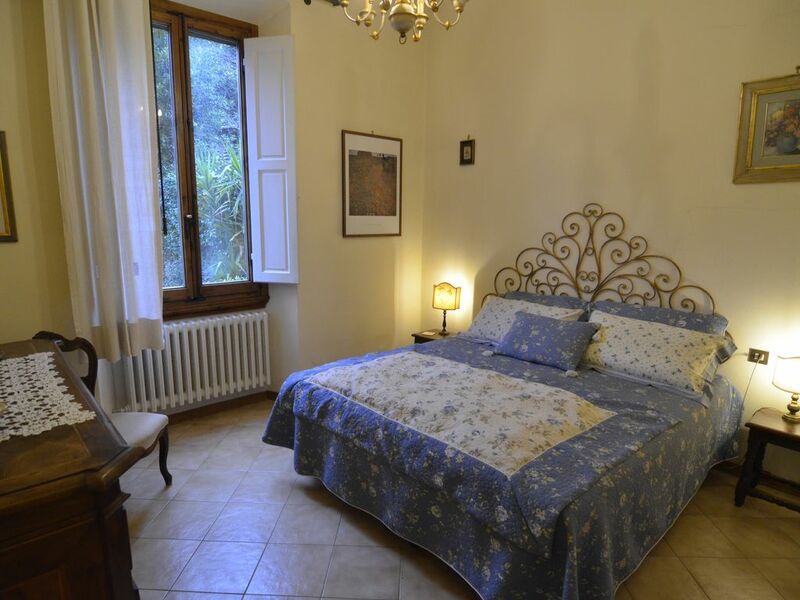 Nice ground floor apartment in Florence, with garden! We enjoyed our short stay here! you will return to Florence again. Immaculate , comfortable, and beautifully appointed. Anna and Giorgio had the most beautifully appointed and comfortable apartment of our stay. We enjoyed it immensely. I would return in a heartbeat and not hesitate to recommend it to friend going to Florence. The fact that it was Oltrarno was a plus. Beautiful property in a very good location, with exceptional hosts. My husband and I stayed here for two weeks in January and my review reflects how very pleased we were with everything. After 10 days exploring elsewhere in Italy, we returned for two days before our homeward bound flight rather than stay in a hotel. The only thing I can add to my previous review is a huge thank you to Anna and Giorgio for being such marvelous hosts. They printed out all our train tickets for our travels elsewhere in Italy, reserved us a taxi to take us to the airport and saw us off at 7 am. They provided all the concierge services of a good hotel. We could not ask for more. See my earlier review for the other wonderful features of this apartment. grazie ancora per le gentili parole per noi e per la nostra casa. Per noi siete stati ospiti simpatici e avete gestito la casa in modo perfetto. thanks again for the kind words for us and for our home. For us you have been nice guests and you have managed the house in a perfect way. Lejligheden er beliggende på boulevarden langs fjortende århundrede vægge immediatamenta ved siden af ​​begrænset trafik og kan nemt nås med bil. Evne til at betale parkering. Et busstoppested 50 meter væk Lines D 12-13 for stationen, den gamle bydel og Piazzale Michelangelo. Glimrende udgangspunkt enten i bil eller med bus for at besøge Siena og Chianti. I umiddelbar nærhed af huset er den karakteristiske historiske distrikt Santo Spirito, som tilbyder en livlig morgen markedet, mange håndværk butikker og gode og billige restauranter med typiske toscanske retter. Brunelleschi - Palazzo Pitti - Boboli Gardens - Ponte Vecchio - Uffizi Gallery etc. Tariffe scontate in relazione alla durata, Consegna delle chiavi da parte del Proprietario.